Use a T55 tork tool. If you don't have the camshaft locked by the special tool you can use a big screwdriver to avoid rotation. Then use the T55 to extract the cap on the acle and a bolt inside the golden sprocket. A big screwdriver? Whats the point? Yes you might get the EXTREMELY tight bolt off to remove the VVT gear that way, but you will never torque it back on to 88ft/lb's using a screwdriver, much less keep the timing right. Look on eBay for the locking tool and do it right. You must be very strong to hold back 88ft/lb of twist with a screwdriver. When i tourqed mine down the camshaft itself was twisting and would spring back when i let off of it. Hi guys, I would if any of you kind fellows on here might be able to help. I too am after the timing procedure for replacing the VVT pulley except mine is on a V70 2001 2.4 non turbo and my VVT is on the inlet side. I understand I need to lock the cams up from the other end of the head with the correct tool. I understand the torque settings and timing mark referred to in the previous pictures, but I am struggling to understand how I mark it up, remove the inlet cam gear and VVT as one, replace the VVT onto the old cam gear sprocket and then re-align it so that its timed properly. Any help would be greatly appreciated, thanks. Basically if you have the cam shafts locked from the rear so they cannot move (and have the crankshaft locked with a pin or 'eyeballed' using the groove on the oil pump housing), the position of the cam gear and VVT gear does not matter. You want their positions to be neutral to the timing belt; not pulling on it on in either direction. Once you have the VVT off and everything else ready you put the new VVT gear on and only snug up the T55 bolt that holds the gear on. You want the gear to be able to rotate freely from the camshaft but not wobble off axis. The same with the other gear (nonVVT, inlet or exhaust?) just have it snugged up but able to move a bit. The you put the timing belt on making sure you don't have a lot of slack between the crankshaft gear and the inlet gear( on my S40 that was the right side of the engine where the belt went straing from the crankshaft to the first cam shaft gear, NOT the side that goes around the tensioner and the other little pulley).Once the belt is on go through the tensioning procedure. Then slowly and gently start tightening the gear bolts up and finally torque them to the proper specs. The gears need to be able to move when your are tensioning the belt so they do not bind the belt any, but don't let them move while your are torqing the bolts. If done properly your gears will be in perfect timing alignment. when I buy the kit to change the timing belt a paper guide comes with a diagram were the pulleys mark shows how to align and seet the proper position for every dented pulley. They are three and the sign "like a line" are in the bottom for the piston axle between the hole and in the engine a "like a arrow" pints to the mark, then in every camshaft pulley in the back appears the "mark like a line" which must align with the upper plastic cover "like a arrow". I also use this video as base to understand the guide printed. Basically if you have the cam shafts locked from the rear so they cannot move (and have the crankshaft locked with a pin or 'eyeballed' using the groove on the oil pump housing), the position of the cam gear and VVT gear does not matter. Not true for the VVT on his car. He doesn't have an S40. My Bad, thanks for catching that ES6T. Ryanthefireman, please ignore my prior statement. I was under the impression that the VVT's were basically the same design across the pre-2004.5 40's, whether they were on the intake or exhaust cam. They are. But the other cars use different ones. I too, have a camshaft crank alignment question. I am ready to reinstall the cover with cams locked on my sons 2007 S40, 2.5 turbo and I'm in need of the crank alignment procedure. I've read of a procedure involving the removal of the starter to position the crank against a tool stop. Any help would be appreciated. You have the cams locked down and the crank is not on it's timing mark? Is it far off? Normally you align the crank then move the cams into position. With the crank aligned the pistons are down in the bore far enough that an open valve cannot touch the pistons. However, with the cams locked down you have open valves. Or are you asking how to hold the crank from turning when reinstalling the pulley nut? Hudini, thanks for the reply. Currently the cam cover and cams are out of the car and I was getting ready to align the crank prior to installing the cover with cams locked. I did align the crank marks last night and it appears that the marks put #1 piston at TDC. My question was mostly do I trust the crank alignment marks. Once I lock down the cams in the cover I am going to verify that the four #1 piston lobes will not be pushing down on the lifters and opening valves as the cover is installed. The only trick might be keeping the cam marks aligned with the cover marks as the center bolt is tightened. It appears this might be a trial and error thing until they are aligned with the bolts tight. I'm new here and it is a pleasure picking up all the available information from the many experienced members. IIRC when you have the crank gear aligned with its mark then all the pistons are down in the bores a bit. IOW, not top dead center as that reference really has no meaning on this engine. You never use TDC for anything. I say that because I had the dreaded bent valves from a slipped timing belt when my VVT gear puked oil all over the belt. When I had the head off and the gear aligned I noticed the pistons were all far enough down to not interfere with an open valve on any cylinder. Anyway, enough of that. Good luck with the fix. Let us know how it goes? Hudini, I figured while I'm in there it was a good time to change the water pump, tensioner, and idler. I had to loosen the inner timing belt cover to gain access to the upper water pump bolts. Not a knuckle friendly work area. The S40 engineers certainly didn't waste much engine compartment space in design. I have to give them credit for getting it all in there. I'll let you know the end result, but I am optimistic. I too had the dreaded oil leak onto belts, but mine was due to the exhaust camshaft seal. Hudini, It went well. I finished assembly yesterday afternoon and it fired right up with no codes. I was a little concerned because the cam lock tool does put the slots at a couple of degree angle from horizontal, but the car runs fine. Bagging all bolts put everything back where it belonged and it went smoothly. I did find that the later year timing belt tensioner does not use an indicator and lock in a position. It has a preloaded pin you remove after the belt is installed and keeps continuous tension on the belt. All things considered, the entire job went well. Thanks again for your help and all of the other postings I poured through. It appears that this thread is never going to die! Here is a thread that references a guide I put together a while back on how to change VVT, etc. I hope it helps someone out there. Make sure you use the last link in the thread vs. the first to access the guide itself. Previous mechanic pulled main crank pulley and timing gear then replaced oil pump o ring and seal. I can rotate Craig around to see the two cut teeth on the timing gear but we already know it's not accurate. Is there a way to reposition the timing gear on the crank shaft to factory so I can get the correct timing. As well, I have an oil leak somewhere on that side. It appears to trickle down the block just below the black plastic backing that covers the engine block and the cam tensioner mounts on the outside of it. I can't see the leak and thought if it was the intake or exhaust cam seals I would see oil on the cam gear but I don't. 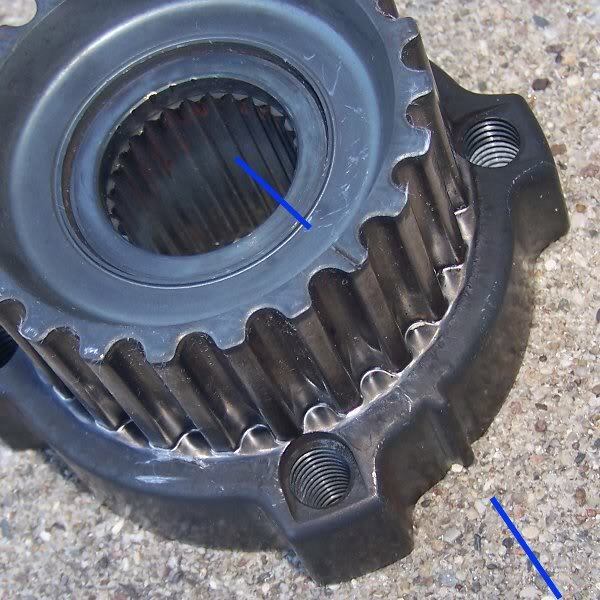 The crank gear has a timing mark to line up with the block.